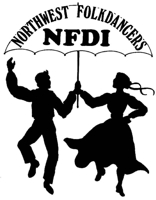 Northwest Folk Dancers Incorporated (NFDI) is a non-profit "umbrella" organization that promotes folk dancing and ethnic events in the Pacific Northwest. NFDI sponsors folk dance festivals and other folk events, provides dance descriptions and practice tapes at a nominal charge for NFDI members, and seeks new ways to promote all forms of ethnic dance. NFDI publishes a monthly magazine, The Northwest Folkdancer, containing articles and advertisements of interest to the folk dance community. One of the most popular features of the magazine is the listings of regular dances and classes and a separate comprehensive calendar of special events. The magazine also contains club news, ethnic recipes, dance descriptions, CD reviews, and other information helpful for dancers, teachers of folk dance, and anyone interested in the food, dances, costumes, and history of other cultures. NFDI also provides scholarships for adults who want to attend folk dance camps and who agree to teach the dances to other NFDI clubs, and youth scholarships for students (high school and college age) who want to participate in a dance camp but need assistance to do so. The Northwest Folkdancer, a magazine.